There are lots of fantastic schemes that schools can tap into to gain valuable funds or equipment for various school projects. Below you’ll find a list of some of these schemes. We will keep adding to the list, so please do let us know if you find a great scheme that works for your school. We all have clothing in our wardrobes that we haven’t worn in ages! In a world of fast fashion, we now have a lot of stuff – but when it comes to a clear out what do you do to make sure the environment comes off best? Using a clothes recycling scheme means you’re helping to keep textiles out of landfill, your old unwanted clothes can go to those in need AND you can earn up to 50p per kilo, depending on the company you use! Based in Newport, this company specialise in collecting from educational sectors. They pay for quality second-hand clothes, which are then sold to other businesses and become affordable clothing to help developing nations. They claim to offer some of the most competitive prices. Run by the Salvation Army, Recycle with Michael is another scheme that can raise money for your school and for charity whilst raising awareness about recycling. When you organise a donation day, they’ll send collection bags for pupils to fill with their unwanted clothing and shoes, then organise an authorised collector to pick up the donations. The money raised from the sale of your donations is split equally between The Salvation Army and your school. From toothpaste tubes to crisp packets and biscuit wrappers to pet food pouches, Terracycle UK offers lots of schemes to recycle a multitude of plastic packaged items. Schools can become drop off points for their local community and collections are rewarded. ReuseMyPC will collect your old laptops, tablets and mobile phones to help 11 million people in the UK get online, of which 500,000 are school children. How many ink and toner cartridges does your school consume? Contained in every ink cartridge is plastics, metals and foam, along with the ink or toner. Throwing these valuable resources into landfill means a loss of resources, but you can recycle them where they will be broken down into component parts and made into new products. Some cartridges can be refilled. Empties Please will take your empty cartridges and award you points. These points can be swapped for ‘green goodies’ for your school such as bulbs, trees, bird houses and gardening tools. Recycling for schools will recycle your used inkjet cartridges and pay you for them. It doesn’t matter whether you’re a small or large school. Cartridges weighing less than 1kg can be sent via one of their freepost labels. For larger quantities, Recycling for schools will organise a free courier collection. SportsafeUK recycle unwanted sports equipment. They collect the old equipment, repair and service it or arrange for recycling disposal. While the company charge a small fee for transport costs, they also make specialist sports equipment – which your school might not ordinarily be able to purchase – more affordable. It’s a great way to reduce landfill waste. Time for some school maintenance? 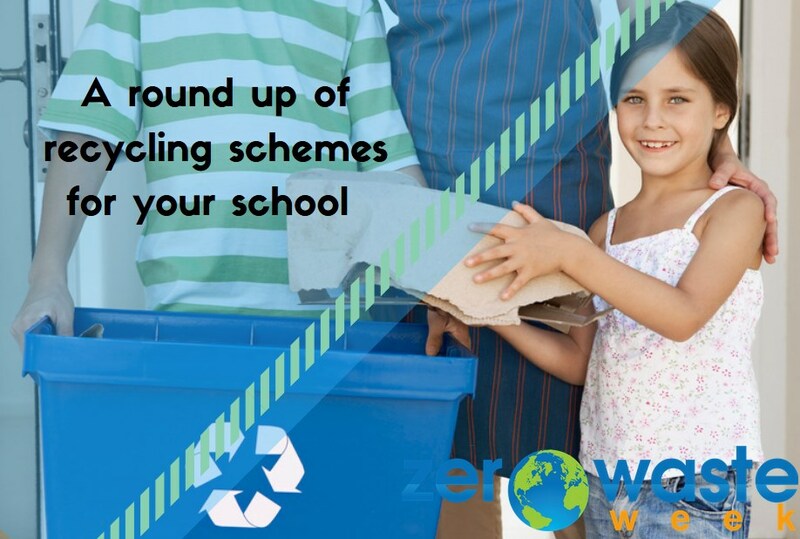 You can also turn to recycling schemes when you have school maintenance projects to do. Check out New Life Paints They reprocess waste water-based paint back into a premium grade emulsion. All products in their paint range contains a minimum 50% recycled content, made up from waste paint diverted from landfill or incineration. Freegle is a brilliant way to give and get stuff for free! It’s ideal if you’re decluttering school cupboards or if you need a new table. There are several scrapstores across the country (now called Reuseful). Scrapstores are given donations of surplus materials by local businesses, which are then sold – or given away – to community groups and schools. Whilst many items are composite materials that will eventually end up in landfill, you can find some gems such as paper and sports equipment.